At Select Mailing, we ensure your direct mail piece is in the hands of your clientele on your time table. Woven through each step of the mailing process, our quality control system ensures that your project is delivered as intended. WINNER! San Diego Regional Chamber of Commerce Excellence in Customer Service Award – we’ll take great care of you and your mailing job. 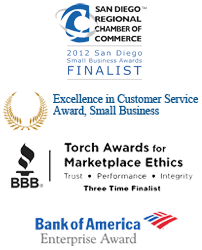 Select Mailing has been serving clients from San Diego and beyond for over nineteen years. Our Select Mailing staff has over 200 years of combined experience! Thousands of successful companies and organizations swear by (and not at) our service; great companies such as Sea World, U.C.S.D., Ronald McDonald House and Thomson-Reuters. Whether it’s variable data marketing, automated inserting or automated mail processing, Select Mailing has the capabilities to meet your needs and exceed your expectations. Instead of “Spraying and Praying” your message will reach your customer’s and constituents, new and old, use Select Mailing to pin point people who fit your demographic profile. Our team of direct mail experts will run through the proverbial “brick wall” to find solutions to overcome your mailing challenges. When you partner with Select Mailing we combine your ideas and our mailing experience to deliver your message with exact precision at the lowest possible cost. Copyright © 1991 - 2019 Select Mailing | All rights reserved.